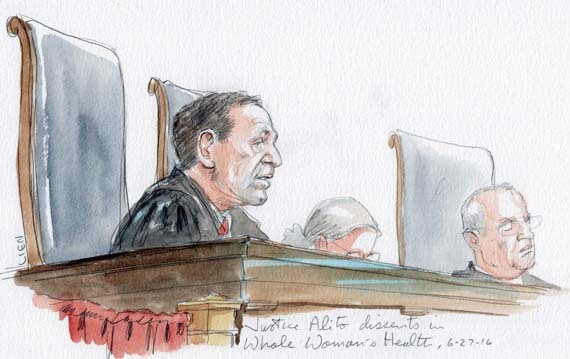 Putting the right to abortion back on the same constitutional footing the Supreme Court laid down nearly a quarter-century ago, a divided Supreme Court on Monday swept away new forms of state restrictions on the way clinics can function. Together with recent refusals by the Court to allow states to narrow the scope of the abortion right itself, the new ruling in Whole Woman’s Health Clinic v. Hellerstedt thwarted a wave of new laws against women’s choice to end pregnancy. The Court’s vote was five to three, indicating that the outcome was not affected by the vacancy left by the death in February of Justice Antonin Scalia. Justice Stephen G. Breyer, handed the assignment to write for the majority by the more senior Justice Anthony M. Kennedy, relied heavily upon the Court’s famous 1992 ruling in Planned Parenthood of Southeastern Pennsylvania v. Casey that Kennedy had helped to put together. The Casey decision had partly reaffirmed the basic abortion rights ruling of 1973, Roe v. Wade, but still protected a wide range of choice for a women to seek an abortion up to “viability” — the point at which the fetus would be capable of living if delivered from the woman’s body. Many state legislatures have recently tried to ban abortions before that point, but the Supreme Court has refused to hear defenses of those new laws, and Breyer’s opinion noted that the Court still follows the 1992 standard. At issue in the new case, named for an abortion clinic in San Antonio, were two parts of a Texas law (“H.B. 2”) passed by the legislature three years ago. Both provisions were ruled unconstitutional Monday: a requirement that any doctor performing an abortion have a privilege to admit patients to a regulate hospital within thirty miles of the clinic; and a requirement that every abortion clinic’s facilities be upgraded to equal those of a surgical center. Unlike the U.S. Court of Appeals for the Fifth Circuit, the five-Justice majority refused to accept the word of the Texas legislature that both of the measures it enacted would protect women’s health. The task of judging whether a law puts an unconstitutional burden on a woman’s right to abortion, the new ruling declared firmly, belongs with the courts, not the legislatures. Both of the restrictions in H.B. 2, the Court declared, put an undue burden on a woman’s access to abortion, and thus cannot stand. Although the Court’s opinion never once questioned the motives of the state legislature, even though challengers to the two restrictions had argued that the health-and-safety argument was a cover for anti-abortion sentiment, his opinion was filled with findings that the legislation would do just the opposite, and imperil the health of pregnant women. At one time before H.B. 2 was passed, Texas had some forty clinics providing abortions throughout the state. About half of those closed after the provision requiring hospital admitting privileges for abortion clinic doctors went into effect, and clinic operators had told the Court that the number would drop to eight or nine clinics if both provisions were upheld and went fully into effect. It is unclear how many, if any, of the closed clinics will now reopen in the wake of the Court’s decision. A key part of the majority opinion was that it struck down both provisions “facially” — that is, the very words of the provisions were invalid, no matter how they might be applied in any practical situation. Although the legislature had specified that, if one part of H.B. 2 were struck down in court, all of the other new restrictions — especially, an array of requirements for surgical centers — would still remain law. The majority said that, while it would normally respect a legislature’s attempt to salvage what it could of a challenged law, that was not a hard-and-fast rule, and in this instance courts and juries should not have to sort through the specific restrictions, clinic by clinic, to determine which were valid and which were unconstitutional. 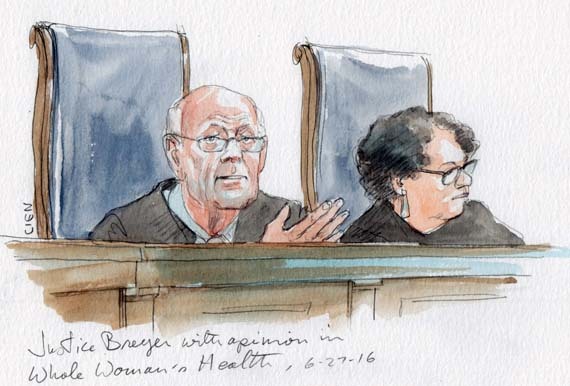 Breyer’s opinion was, as is often true of his writing, workmanlike and almost entirely devoid of the kind of rhetorical flourishes that are common in Kennedy opinions — and, in fact, were a notable part of the Casey opinion twenty-four years ago. Still, the opinion did what the clinics had sought, and spared all of them — in Texas and elsewhere — from the new kind of restraints on clinic functioning. 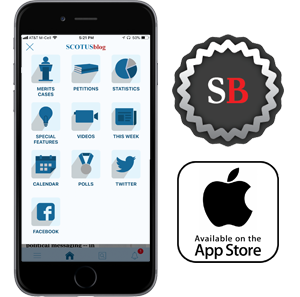 The main opinion was joined by Justices Kennedy, Ruth Bader Ginsburg, Elena Kagan, and Sonia Sotomayor. Justice Ginsburg filed a brief concurring for herself, adding little to what Breyer had written. 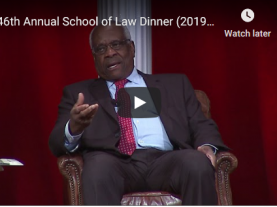 Justice Clarence Thomas filed a dissenting opinion, writing for himself alone, arguing that the new decision illustrates what he said was the tendency of the Court to treat abortion rights more favorably than other rights. The Thomas opinion also complained of the Court’s long-standing view that doctors and clinics should be allowed to sue on behalf of their women patients to challenge anti-abortion laws. Following Monday’s ruling, the Justices are expected to act tomorrow on two pending cases involving similar state laws involving hospital admitting privileges for abortion doctors — laws in Mississippi and Wisconsin.